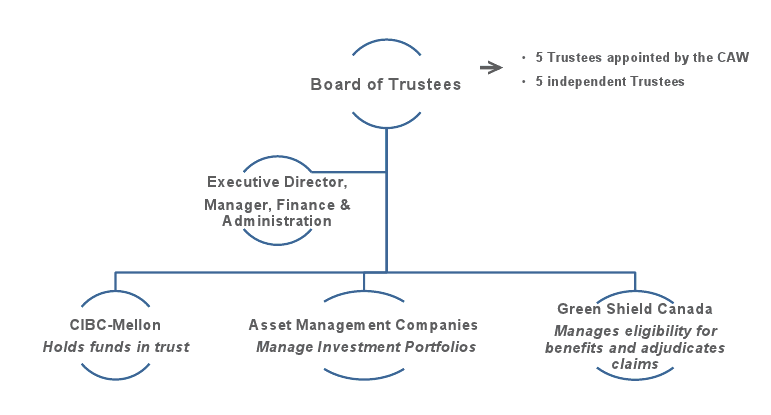 Ultimate authority over the asrTrust and the benefit plan rests with the Board of Trustees. This consists of 5 Trustees appointed by the CAW and 5 independent Trustees who are experts in fields relevant to the administration of a health care benefit plan (the "Trustees"). Keeping administrative costs to a minimum is a primary objective of asrTrust. Every dollar that is spent on administration means one less dollar available for paying benefits. To meet this goal the Trust set up a lean and efficient organization with a very small staff led by the Executive Director. Critical functions are delegated to best-in-class firms chosen for their capability, client service and competitive costs. These service delivery partners are closely managed by the Trust and the Executive Director to ensure that members receive the very best service at the very best price.